Robust internet services for mid-sized businesses. 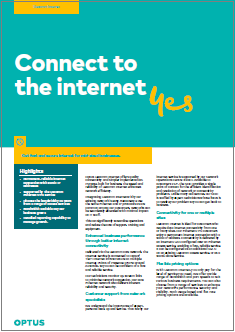 Fast, secure internet service is essential to modern business, whether it be for a simple website or more business-critical applications like network connectivity and "Software as a Service". Uecomm Internet offers quality connectivity and simple implementation. Purpose-built for mid-sized businesses, the speed and reliability of Uecomm Internet enhances network efficiency. Detailed reporting capability to manage growth. Connectivity for one or multiple sites. Uecomm Internet is ideal for customers who require data internet connectivity from one or many sites. Delivered over a Uecomm Ethernet VPN service, customers enjoy a permanent internet connection with a static IP address. Only pay for the level of service you need. We offer a wide range of bandwidth and port speeds to suit various business requirements. You can also choose from a range of services to enhance your network's performance, security and visibility. Both usage based and flat rate pricing options are available. Access to detailed traffic statistics 24 x 7. Reporting capabilities enable you to analyse usage trends, implement routing policies, manage bandwidth and plan upgrades more easily. A single point of contact. 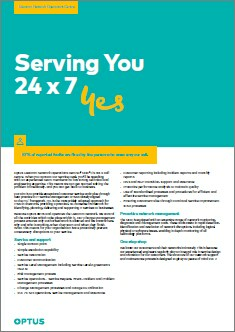 Our Optus Uecomm Network Operations Centre (NOC) is available 24 x 7 for the efficient identification and resolution of network or connectivity problems. Integrating Uecomm Internet with your existing network is easy, it uses Ethernet and IP protocols, so networks can be seamlessly extended with minimal impact on IT staff. Connectivity is delivered by an internet VLAN configured over a Uecomm Ethernet access service, enabling a fast, reliable service. It can be configured as an additional VLAN on an existing Uecomm access service, or as a stand-alone service. Because all Uecomm Internet Points of Presence (PoPs) are connected directly to a Tier 1 provider, customers can be confident of a reliable and fast service. Performance is further supported by the use of diverse links in the major states. Our technicians monitor up-stream links to minimise network congestion. The core Uecomm Ethernet network also delivers inherent reliability and security. Who do I call for Optus Uecomm support? Existing customers click here to log into CLIP. Get fast and secure internet. 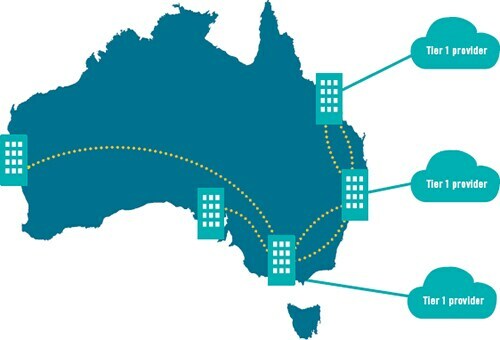 Optus Uecomm Network Operations Centre serving you 24 x 7.